The message is just a silly hoax. Bill Gates is certainly not giving $5000 to those who share a picture on Facebook. The prankster behind the hoax has digitally altered a photograph of Gates holding up an entirely different sign. This prank clearly pays homage to a very old hoax that claimed that Microsoft would pay people for forwarding an email message. Hey Facebook, As some of you may know, I’m Bill Gates. If you click that share link, I will give you $5,000. I always deliver, I mean, I brought your Windows XP, right? Is Bill Gates giving $5000 to every person who shares his picture on Facebook? No, of course, he isn’t! The image, which has circulated via Facebook, for several years, depicts Gates holding a sign claiming that he will give $5000 to those Facebook users who click the “share” link for the picture. Not surprisingly, however, the message is just a hoax. In 2013, Gates, in his capacity as Chairman of the Bill and Melinda Gates Foundation, participated in a Reddit “Ask Me Anything” session to answer user queries about the Foundation. He submitted the above picture – featuring the message ‘Hi! Reddit! 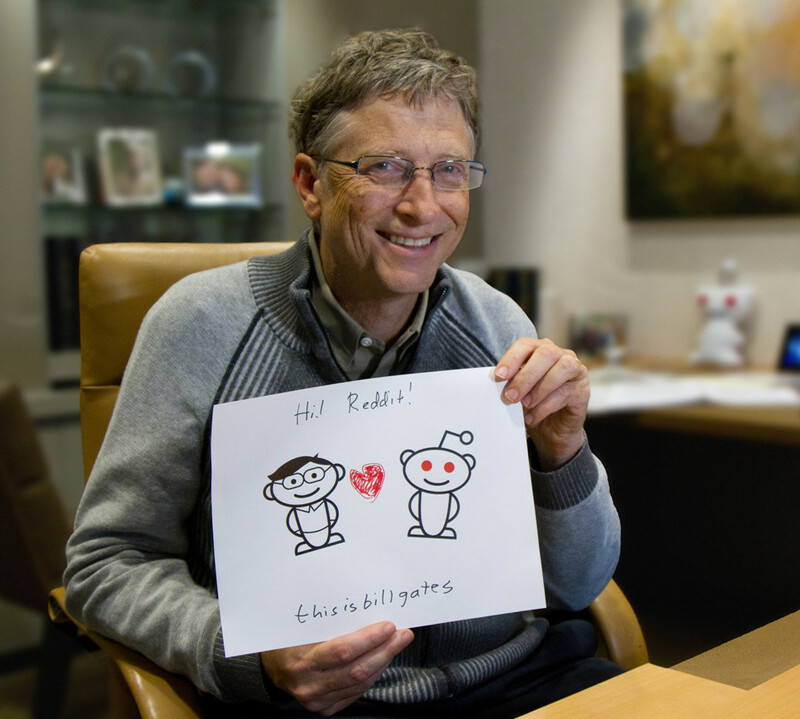 this is bill gates’ – so that Reddit users could verify that it was really him participating in the session. Many users will immediately recognize the doctored picture as just a rather harmless leg-pull. Nevertheless, at least a few apparently believe that the claims are true and have shared the picture in the forlorn hope of receiving their $5000. This hoax clearly pays homage to that all-time classic of email pranks, the Microsoft Beta Test hoax. Beginning as far back as 1999, email and social media messages have been circulating that falsely claim that Bill Gates and Microsoft are running a beta test and are therefore paying people to forward or repost a specific message. The ‘beta test’message is, of course, utter nonsense, but has nevertheless managed to dupe wide-eyed Internet users into resending for well over a decade.